Clemenceau was Prime Minister of France from 1906 to 1909 and from 1917 to 1920. Demanding a total victory over Germany, he wanted reparations, colonies, Alsace-Lorraine, and strict rules to prevent Germany from rearming. He achieved these goals in the Treaty of Versailles imposed on Germany at the Paris Peace Conference of 1919. Nicknamed "Père la Victoire" (Father Victory) or "Le Tigre" (The Tiger), in the 1920s he continued his harsh position against Germany, though not quite as much as the President Raymond Poincaré. He obtained mutual defense treaties with Britain and the United States, to unite against German aggression, but these never took effect. Clemenceau was a native of the Vendée, born at Mouilleron-en-Pareds. During the period of the French Revolution, the Vendée had been a hotbed of monarchist sympathies. The region was remote from Paris, rural and poor. His mother, Sophie Eucharie Gautreau (1817–1903), was of Huguenot descent. His father, Benjamin Clemenceau (1810–1897), came from a long line of physicians, but he lived off his lands and investments and did not practice medicine. Benjamin was a political activist; he was arrested and briefly held in 1851 and again in 1858. He instilled in his son a love of learning, devotion to radical politics, and a hatred of Catholicism. 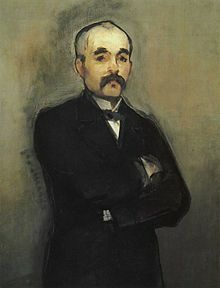 The lawyer Albert Clemenceau (1861–1955) was his brother. His mother was devoutly Protestant; his father was an atheist, and insisted that his children should have no religious education. Georges was interested in religious issues. He was a lifelong atheist with a sound knowledge of the Bible. He became a leader of anti-clerical or "Radical" forces that battled against the Catholic Church in France and the Catholics in politics. He stopped short of the more extreme attacks. His position was that if church and state were kept rigidly separated, he would not support oppressive measures designed to further weaken the Church. He finally graduated as a doctor of medicine on 13 May 1865, founded several literary magazines, and wrote many articles, most of which attacked the imperial regime of Napoleon III. Clemenceau left France for the United States when the imperial agents began cracking down on dissidents, sending most of them to the bagne de Cayennes (Devil's Island Penal System) in French Guiana. Clemenceau worked in New York City in the years 1865-69, following the American Civil War. He maintained a medical practice, but spent much of his time on political journalism for a Parisian newspaper. He taught French at the home of Calvin Rood in Great Barrington, Massachusetts, and also taught and rode horseback at a private girls' school in Stamford, Connecticut. On 23 June 1869, he married one of his students, Mary Eliza Plummer (1849–1922), in New York City. She was the daughter of William Kelly Plummer and wife Harriet A. Taylor. The Clemenceaus had three children together before the marriage ended in a contentious divorce. During this time, he joined French exile clubs in New York opposing the imperial regime. In 1880, Clemenceau started his newspaper La Justice, which became the principal organ of Parisian Radicalism. From this time, throughout the presidency of Jules Grévy (1879-1887), he became widely known as a political critic and destroyer of ministries (le Tombeur de ministères) who avoided taking office himself. Leading the far left in the Chamber of Deputies, he was an active opponent of the colonial policy of Prime Minister Jules Ferry, which he opposed on moral grounds and also as a form of diversion from the more important goal of "Revenge against Germany" for the annexation of Alsace and Lorraine after the Franco-Prussian War. In 1885, his criticism of the conduct of the Sino-French War contributed strongly to the fall of the Ferry cabinet that year. By his exposure of the Wilson scandal, and by his personal plain speaking, Clemenceau contributed largely to Jules Grévy's resignation of the presidency of France in 1887. He had declined Grévy's request to form a cabinet upon the downfall of the cabinet of Maurice Rouvier by advising his followers to vote for neither Charles Floquet, Jules Ferry, nor Charles de Freycinet, he was primarily responsible for the election of an "outsider," Marie François Sadi Carnot, as president. The split in the Radical Party over Boulangism weakened his hand, and its collapse meant that moderate republicans did not need his help. A further misfortune occurred in the Panama affair, as Clemenceau's relations with the businessman and politician Cornelius Herz led to his being included in the general suspicion. In response to accusations of corruption leveled by the nationalist politician Paul Déroulède, Clemenceau fought a duel with him on 23 December 1892. Six shots were discharged, but neither participant was injured. Clemenceau remained the leading spokesman for French radicalism, but his hostility to the Franco-Russian Alliance so increased his unpopularity that in the French legislative elections of 1893, he was defeated for his seat in the Chamber of Deputies, after having held it continuously since 1876. On 13 January 1898, Clemenceau published Émile Zola's J'Accuse…! on the front page of the Paris daily newspaper L'Aurore, of which he was owner and editor. He decided to run the controversial article, which would become a famous part of the Dreyfus Affair, in the form of an open letter to Félix Faure, the president of France. Clemenceau sat with the Independent Radicals in the Senate and moderated his positions, although he still vigorously supported the Radical-Socialist ministry of Prime Minister Émile Combes, who spearheaded the anti-clericalist republican struggle. In June 1903, he undertook the direction of the journal L'Aurore, which he had founded. In it, he led the campaign to revisit the Dreyfus affair, and to create a separation of Church and State in France. The latter was implemented by the 1905 French law on the Separation of the Churches and the State. In March 1906 the ministry of Maurice Rouvier fell as a result of civil disturbances provoked by the implementation of the law on the separation of church and state and the victory of radicals in the French legislative elections of 1906. The new government of Ferdinand Sarrien appointed Clemenceau as Minister of the Interior in the cabinet. On a domestic level, Clemenceau reformed the French police forces and ordered repressive policies towards the workers' movement. He supported the formation of scientific police by Alphonse Bertillon, and founded the Brigades mobiles (French for "mobile squads") led by Célestin Hennion. These squads were nicknamed Brigades du Tigre ("The Tiger's Brigades") after Clemenceau himself. The miners' strike in the Pas de Calais after the Courrières mine disaster, which resulted in the death of more than one thousand persons, threatened widespread disorder on 1 May 1906. Clemenceau ordered the military against the strikers and repressed the wine-growers' strike in the Languedoc-Roussillon. His actions alienated the French Section of the Workers' International (SFIO) socialist party, from which he definitively broke in his notable reply in the Chamber of Deputies to Jean Jaurès, leader of the SFIO, in June 1906. Clemenceau's speech positioned him as the strong man of the day in French politics; when the Sarrien ministry resigned in October, Clemenceau became premier. After a proposal by the deputy Paul Dussaussoy for limited women's suffrage in local elections, Clemenceau published a pamphlet in 1907 in which he declared that if women were given the vote France would return to the Middle Ages. As the revolt of the Languedoc winegrowers developed Clemenceau at first dismissed the complaints, then sent in troops to keep the peace in June 1907. During 1907 and 1908, he led the development of a new Entente cordiale with Britain, which gave France a successful role in European politics. Difficulties with Germany and criticism by the Socialist party in connection with the handling of the First Moroccan Crisis in 1905–06 were settled at the Algeciras Conference. Clemenceau was defeated on 20 July 1909 in a discussion in the Chamber of Deputies on the state of the navy, in which bitter words were exchanged between him and Théophile Delcassé, the former president of the Council whose downfall Clemenceau had aided. Refusing to respond to Delcassé's technical questions, Clemenceau resigned after his proposal for the order of the day vote was rejected. He was succeeded as premier by Aristide Briand, with a reconstructed cabinet. Between 1909 and 1912, Clemenceau dedicated his time to travel, conferences and the treatment of his illness. He went to South America in 1910, traveling to Brazil, Uruguay and Argentina (where he went as far as Santa Ana de Tucuman in northwest Argentina). There, he was amazed by the influence of French culture and of the French Revolution on local elites. He published the first issue of the Journal du Var on 10 April 1910. Three years later, on 6 May 1913, he founded L'Homme libre ("The Free Man") newspaper in Paris, for which he wrote a daily editorial. In these media, Clemenceau focused increasingly on foreign policy and condemned the Socialists' anti-militarism. At the outbreak of World War I in France in August 1914, Clemenceau's newspaper was one of the first to be censored by the government; it was suspended from 29 September 1914 to 7 October. In response, Clemenceau changed the newspaper's name to L'Homme enchaîné ("The Chained Man"). He criticized the government for its lack of transparency and its ineffectiveness, while defending the patriotic union sacrée against the German Empire. In spite of the censorship imposed by the French government on Clemenceau's journalism at the beginning of World War I, he still wielded considerable political influence. As soon as the war started, Clemenceau advised Interior Minister Malvy to invoke Carnet B, a list of known and suspected subversives who were supposed to be arrested on mobilisation. The Prefect of Police gave the same advice, but the government did not follow it, with the result that 80% of the 2,501 people listed on Carnet B volunteered for service. Clemenceau declined to join the government of national unity as Justice Minister in autumn 1914. He was a vehement critic of the war-time French government, asserting that it was not doing enough to win the war. His stance was driven by a will to regain the province of Alsace-Lorraine, a view shared by public opinion. The autumn of 1917 saw the disastrous Italian defeat at the Battle of Caporetto, the Bolshevik seizure of power in Russia, and rumours that former Prime Minister Joseph Caillaux and Interior Minister Louis Malvy might have engaged in treason. Prime Minister Paul Painlevé was inclined to open negotiations with Germany. Clemenceau argued that even German restitution of Alsace-Lorraine and the liberation of Belgium would not be enough to justify France abandoning her Allies. This forced Alexandre Ribot and Aristide Briand (both the previous two Prime Ministers, of whom the latter was by the far more powerful politician and had been approached by a German diplomat) to agree in public that there would be no separate peace. For many years, Clemenceau was blamed for having blocked a possible compromise peace, but it is now clear from examination of German documents that Germany had no serious intention of handing over Alsace-Lorraine. The prominence of his opposition made him the best known critic and the last man standing when the others had failed. "Messieurs, les Allemands sont toujours à Noyon" (Gentlemen, the Germans are still at Noyon) wrote Clemenceau’s paper endlessly. In November 1917, at one of the darkest hours for the French war effort in World War I, Clemenceau was appointed prime minister. Unlike his predecessors, he discouraged internal disagreement and called for peace among the senior politicians. Churchill later wrote that Clemenceau "looked like a wild animal pacing to and fro behind bars" in front of "an assembly which would have done anything to avoid putting him there, but, having put him there, felt they must obey". Clemenceau's assumption of power meant little to the men in the trenches at first. They thought of him as "just another politician", and the monthly assessment of troop morale found that only a minority found comfort in his appointment. Slowly, however, as time passed, the confidence he inspired in a few began to grow throughout all the fighting men. They were encouraged by his many visits to the trenches. This confidence began to spread from the trenches to the home front and it was said,[by whom?] "We believed in Clemenceau rather in the way that our ancestors believed in Joan of Arc." After years of criticism against the French army for its conservatism and Catholicism, Clemenceau would need help to get along with the military leaders in order to achieve a sound strategic plan. He nominated General Henri Mordacq to be his military chief of staff. Mordacq helped to inspire trust and mutual respect from the army to the government which proved essential to the final victory. Clemenceau was also well received by the media, because they felt that France was in need for strong leadership. It was widely recognized that throughout the war he was never discouraged and never stopped believing that France could achieve total victory. There were skeptics, however, that believed that Clemenceau, like other war time leaders, would have a short time in office. It was said,[by whom?] "Like everyone else … Clemenceau will not last long- only long enough to clean up [the war]." As the military situation worsened in early 1918, Clemenceau continued to support the policy of total war – "We present ourselves before you with the single thought of total war" – and the policy of "la guerre jusqu'au bout" (war until the end). His speech of 8 March advocating this policy was so effective that it left a vivid impression on Winston Churchill, who would make similar speeches on becoming British prime minister in 1940. Clemenceau's war policy encompassed the promise of victory with justice, loyalty to the fighting men, and immediate and severe punishment of crimes against France. Joseph Caillaux, a former French prime minister, disagreed with Clemenceau's policies. He wanted to surrender to Germany and negotiate a peace, thus Clemenceau viewed Caillaux as a threat to national security. Unlike previous ministers, Clemenceau moved against Caillaux publicly. As a result, a parliamentary committee decided that Caillaux would be arrested and imprisoned for three years. 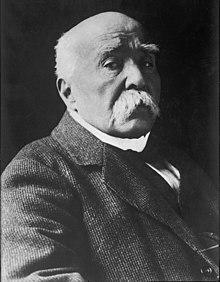 Clemenceau believed, in the words of Jean Ybarnégaray, that Caillaux's crime "was not to have believed in victory [and] to have gambled on his nation's defeat". The arrest of Caillaux and others raised the issue of Clemenceau's harshness but the only powers that Clemenceau assumed were those that he thought necessary to win the war.. The many trials and arrests aroused great public excitement. These trials, far from making the public fear the government, inspired confidence, as they felt that for the first time in the war, action was being taken and they were being firmly governed. The claims that Clemenceau's "firm government" was a dictatorship found little support. Clemenceau was still held accountable to the people and media. He relaxed censorship on political views as he believed that newspapers had the right to criticize political figures: "The right to insult members of the government is inviolable." In 1918, Clemenceau thought that France should adopt Woodrow Wilson's Fourteen Points, mainly because of its point that called for the return of Alsace-Lorraine to France. This meant that victory would fulfill the war aim that was crucial for the French public. Clemenceau was sceptical about some other points, however, including those concerning the League of Nations, as he believed that the latter could succeed only in a utopian society. As war minister, Clemenceau was also in close contact with his generals, but he did not always make the most effective decisions concerning military issues (though he did heed the advice of the more experienced generals). As well as talking strategy with the generals, he also went to the trenches to see the poilus, the French infantrymen. He would speak to them and assure them that their government was actually looking after them. The poilus had great respect for Clemenceau and his disregard for danger, as he often visited soldiers only yards away from German frontlines. The government was worried about the visits of Clemenceau to the front lines, as he was most of the time risking his own life by insulting and threatening the German soldiers in person directly from the trenches. These visits, his speech, and his verbal threats directly to the enemy impressed the soldiers and contributed to Clemenceau's title "Père la Victoire" (Father of Victory). On 21 March 1918, the Germans began their great Spring Offensive. The Allies were caught off guard and a gap was created in the British/French lines that risked handing over access to Paris to the Germans. This defeat cemented Clemenceau's belief, and that of the other allies, that a coordinated, unified command was the best option. It was decided that Ferdinand Foch would be appointed as Generalissimo. The German line continued to advance, and Clemenceau believed that they could not rule out the fall of Paris. It was believed[by whom?] that if "the tiger" as well as Foch and Philippe Pétain stayed in power, for even another week, France would be lost. It was thought[by whom?] that a government headed by Aristide Briand would be beneficial to France, because he would make peace with Germany on advantageous terms. Clemenceau adamantly opposed these opinions and he gave an inspirational speech in the Chamber of Deputies; the Chamber subsequently voted their confidence in him by 377 votes to 110. As the Allied counter-offensives began to push the Germans back, it became clear that the Germans could no longer win the war. Although they still occupied vast amounts of French territory, they did not have sufficient resources and manpower to continue their attack. As countries allied to Germany began to ask for an armistice, it was obvious that Germany would soon follow. On 11 November 1918, an armistice with Germany was signed. Clemenceau was embraced in the streets and attracted admiring crowds. He was a strong, energetic, positive leader who was key to the allied victory of 1918. To settle the international political issues left over from the conclusion of World War I, it was decided that a peace conference would be held in Paris, France. Famously, the Treaty of Versailles between Germany and the Allied Powers to conclude the conflict was signed in the Palace of Versailles, but the deliberations on which it was based were conducted in Paris, hence the name given to the meeting of the victorious heads of state that produced the treaties signed with the defeated powers: the Paris Peace Conference of 1919. On 13 December 1918, United States president Woodrow Wilson received an enthusiastic welcome in France. His Fourteen Points and the concept of a League of Nations had made a big impact on the war-weary French. Clemenceau realized at their first meeting that he was a man of principle and conscience. The progress at the conference was much slower than anticipated, and decisions were constantly being tabled. It was this slow pace that induced Clemenceau to give an interview showing his irritation to an American journalist. He said he believed that Germany had won the war industrially and commercially as its factories were intact and its debts would soon be overcome through "manipulation". In a short time, he believed, the German economy would be much stronger than the French. France's diplomatic position at the Paris Peace Conference was repeatedly jeopardized by Clemenceau's mistrust of David Lloyd George and Woodrow Wilson, and his intense dislike of French President Raymond Poincaré. When negotiations reached a stalemate, Clemenceau had a habit of shouting at the other heads of state and storming out of the room rather than participating in further discussion. On 19 February 1919, during the Paris Peace Conference, as Clemenceau was leaving his apartment in the Rue Benjamin-Franklin [fr] to drive to a meeting with Woodrow Wilson's aide Edward M. House and British Foreign Secretary Arthur Balfour at the Hôtel de Crillon, a man jumped out and fired several shots at the car. One bullet hit Clemenceau between the ribs, just missing his vital organs. Too dangerous to remove, the bullet remained with him for the rest of his life. Clemenceau's assailant, anarchist Émile Cottin, was seized by the crowd following the leader's procession and nearly lynched. Taken back to his house, Clemenceau's faithful assistant found him pale, but conscious. "They shot me in the back," Clemenceau told him. "They didn't even dare to attack me from the front." Clemenceau often joked about the "assassin's" bad marksmanship – "We have just won the most terrible war in history, yet here is a Frenchman who misses his target 6 out of 7 times at point-blank range. Of course this fellow must be punished for the careless use of a dangerous weapon and for poor marksmanship. I suggest that he be locked up for eight years, with intensive training in a shooting gallery." When Clemenceau returned to the Council of Ten on 1 March he found that little had changed. One issue that had not changed at all was a dispute over France's long-running eastern frontier and control of the German Rhineland. Clemenceau believed that Germany's possession of this territory left France without a natural frontier in the East and thus simplified invasion into France for an attacking army. The British ambassador reported in December 1918 on Clemenceau's views on the future of the Rhineland: "He said that the Rhine was a natural boundary of Gaul and Germany and that it ought to be made the German boundary now, the territory between the Rhine and the French frontier being made into an Independent State whose neutrality should be guaranteed by the great powers". The issue was finally resolved when Lloyd George and Woodrow Wilson guaranteed immediate military assistance if Germany attacked without provocation. It was also decided that the Allies would occupy the territory for fifteen years, and that Germany could never rearm the area. Lloyd George insisted on a clause allowing for the early withdrawal of Allied troops if the Germans fulfilled the treaty; Clemenceau inserted Article 429 into the treaty that permitted the Allied occupation beyond the fifteen years if adequate guarantees for Allied security against unprovoked aggression were not met. This was in case the U.S. Senate refused to ratify the treaty of guarantee, thereby making null and void the British guarantee as well, since that was dependent on the Americans being part of it. This is, in fact, what did occur. Article 429 ensured that a refusal of the U.S. Senate to ratify the treaties of guarantee would not weaken them. President Poincaré and Marshal Ferdinand Foch both repeatedly pressed for an autonomous Rhineland state. At a Cabinet meeting on 25 April Foch spoke against the deal Clemenceau had brokered and pushed for a separate Rhineland. On 28 April Poincaré sent Clemenceau a long letter detailing why he thought Allied occupation should continue until Germany had paid all her reparations. Clemenceau replied that the alliance with America and Britain was of more value than an isolated France which held onto the Rhineland: "In fifteen years I will be dead, but if you do me the honour of visiting my tomb, you will be able to say that the Germans have not fulfilled all the clauses of the treaty, and that we are still on the Rhine". Clemenceau said to Lloyd George in June: "We need a barrier behind which, in the years to come, our people can work in security to rebuild its ruins. The barrier is the Rhine. I must take national feelings into account. That does not mean that I am afraid of losing office. I am quite indifferent on that point. But I will not, by giving up the occupation, do something which will break the willpower of our people". He said later to Jean Martel: "The policy of Foch and Poincaré was bad in principle. It was a policy no Frenchman, no republican Frenchman could accept for a moment, except in the hope of obtaining other guarantees, other advantages. We leave that sort of thing to Bismarck". There was increasing discontent among Clemenceau, Lloyd George and Woodrow Wilson about slow progress and information leaks surrounding the Council of Ten. They began to meet in a smaller group, called the Council of Four, Vittorio Orlando of Italy being the fourth, though less weighty, member. This offered greater privacy and security and increased the efficiency of the decision-making process. Another major issue that the Council of Four discussed was the future of the German Saar region. Clemenceau believed that France was entitled to the region and its coal mines after Germany deliberately damaged the coal mines in northern France. Wilson, however, resisted the French claim so firmly that Clemenceau accused him of being "pro-German". Lloyd George came to a compromise; the coal mines were given to France and the territory placed under French administration for 15 years, after which a vote would determine whether the region would rejoin Germany. Although Clemenceau had little knowledge of the Austrian-Hungarian empire, he supported the causes of its smaller ethnic groups and his adamant stance lead to the stringent terms in the Treaty of Trianon that dismantled Hungary. Rather than recognizing territories of the Austrian-Hungarian empire solely within the principles of self-determination, Clemenceau sought to weaken Hungary, just as Germany was, and remove the threat of such a large power within Central Europe. The entire Czechoslovakian state was seen a potential buffer from Communism and this encompassed majority Hungarian territories. Clemenceau was not experienced in the fields of economics or finance, and as John Maynard Keynes pointed out "he did not trouble his head to understand either the Indemnity or [France’s] overwhelming financial difficulties", but he was under strong public and parliamentary pressure to make Germany's reparations bill as large as possible. It was generally agreed that Germany should not pay more than it could afford, but the estimates of what it could afford varied greatly. Figures ranged between £2,000 million and £20,000 million. Clemenceau realised that any compromise would anger both the French and British citizens and that the only option was to establish a reparations commission which would examine Germany's capacity for reparations. This meant that the French government was not directly involved in the issue of reparations. The Treaty of Versailles was signed on 28 June 1919. Clemenceau now had to defend the treaty against critics who viewed the compromises Clemenceau had negotiated as inadequate for French national interests. The French Parliament debated the treaty and Louis Barthou on 24 September claimed that the U.S. Senate would not vote for the treaty of guarantee or the Treaty of Versailles and therefore it would have been wiser to have the Rhine as a frontier. Clemenceau replied that he was sure the Senate would ratify both and that he had inserted Article 429 into the treaty, providing for "new arrangements concerning the Rhine". This interpretation of Article 429 was disputed by Barthou. The Chamber of Deputies ratified the treaty by 372 votes to 53, with the Senate voting unanimously for its ratification. On 11 October he gave his last parliamentary speech, to the Senate. He said that any attempt to partition Germany would be self-defeating and that France must find a way of living with sixty million Germans. He also said that the bourgeoisie, like the aristocracy before them in the ancien régime, had failed as a ruling class. It was now the turn of the working class to rule. He advocated national unity and a demographic revolution: "The treaty does not state that France will have many children, but it is the first thing that should have been written there. For if France does not have large families, it will be in vain that you put all the finest clauses in the treaty, that you take away all the Germans guns, France will be lost because there will be no more French". Clemenceau's final tenure as prime minister witnessed the implementation of various reforms aimed at regulating the hours of labour. A general 8-hour-day law passed in April 1919 amended the French Labour Code, and in June that year, existing legislation concerning the duration of the working day in the mining industry was amended by extending the eight-hour day to all classes of workpeople, "whether employed underground or on the surface." Under a previous law of December 1913, the eight-hour limit had only applied to workpeople employed underground. In August 1919, a similar limit was introduced for all those employed in French vessels. Another law passed in 1919 (which came into operation in October 1920) prohibited employment in bakeries between the hours of 10 P.M. and 4 A.M. A decree of May 1919 introduced the 8-hour day for workers on trams, railways, and in inland waterways, and a second of June 1919 extended this provision to the State railways. In April 1919, an enabling Act was approved for an eight-hour day and a six-day week, although farmworkers were excluded from the Act. His friend Georges Mandel urged Clemenceau to stand for the presidency in the upcoming election and on 15 January 1920 he let Mandel announce that he would be prepared to serve if elected. However Clemenceau did not intend to campaign for the post, instead he wished to be chosen by acclaim as a national symbol. The preliminary meeting of the republican caucus (a forerunner to the vote in the National Assembly) chose Paul Deschanel instead of Clemenceau by a vote of 408 to 389. In response, Clemenceau refused to be put forward for the vote in the National Assembly because he did not want to win by a small majority, but by a near-unanimous vote. Only then, he claimed, could he negotiate with confidence with the Allies. In his last speech to the Cabinet on 18 January he said, "We must show the world the extent of our victory, and we must take up the mentality and habits of a victorious people, which once more takes its place at the head of Europe. But all that will now be placed in jeopardy...It will take less time and less thought to destroy the edifice so patiently and painfully erected than it took to complete it. Poor France. The mistakes have begun already". Clemenceau resigned as prime minister as soon as the presidential election was held (17 January 1920) and took no further part in politics. In private, he condemned the unilateral occupation by French troops of the German city of Frankfurt in 1920 and said if he had been in power, he would have persuaded the British to join it. He took a holiday in Egypt and the Sudan from February to April 1920, then embarked for the Far East in September, returning to France in March 1921. In June, he visited England and received an honorary degree from the University of Oxford. He met Lloyd George and said to him that after the Armistice he had become the enemy of France. Lloyd George replied, "Well, was not that always our traditional policy?" He was joking, but after reflection, Clemenceau took it seriously. After Lloyd George's fall from power in 1922 Clemenceau remarked, "As for France, it is a real enemy who disappears. Lloyd George did not hide it: at my last visit to London he cynically admitted it". In late 1922, Clemenceau gave a lecture tour in the major cities of the American northeast. He defended the policy of France, including war debts and reparations, and condemned American isolationism. He was well received and attracted large audiences, but America's policy remained unchanged. On 9 August 1926, he wrote an open letter to the American President Calvin Coolidge that argued against France paying all its war debts: "France is not for sale, even to her friends". This appeal went unheard. He condemned Poincaré's occupation of the Ruhr in 1923 as an undoing of the entente between France and Britain. He wrote two short biographies, one of the Greek orator Demosthenes and one of the French painter Claude Monet. He also penned a huge two-volume tome, covering philosophy, history and science, titled Au Soir de la Pensée. Writing this occupied most of his time between 1923 and 1927. During his last months, he wrote his memoirs, despite declaring previously that he would not write them. He was spurred into doing so by the appearance of Marshal Foch's memoirs, which were highly critical of Clemenceau, mainly for his policy at the Paris Peace Conference. He only had time to finish the first draft and it was published posthumously as Grandeurs et Misères d'une Victoire (The Grandeur and Misery of Victory). He was critical of Foch and also of his successors who had allowed the Versailles Treaty to be undermined in the face of Germany's revival. He burned all of his private letters. Gaston Doumergue – Minister of Commerce and Industry. 4 January 1908 – Aristide Briand succeeds Guyot-Dessaigne as Minister of Justice. Gaston Doumergue succeeds Briand as Minister of Public Instruction and Fine Arts. Briand remains Minister of Worship. Jean Cruppi succeeds Doumergue as Minister of Commerce and Industry. 22 October 1908 – Alfred Picard succeeds Thomson as Minister of Marine. Charles Jonnart – Minister of Liberated Regions and Blockade. 23 November 1917 – Albert Lebrun succeeds Jonnart as Minister of Liberated Regions and Blockade. 26 November 1918 – Louis Loucheur becomes Minister of Industrial Reconstitution. His office of Minister of Armaments and War Manufacturing is abolished. 24 December 1918 – The office of Minister of Blockade is abolished. Lebrun remains Minister of Liberated Regions. 20 July 1919 – Joseph Noulens succeeds Boret as Minister of Agriculture and Supply. 6 November 1919 – André Tardieu succeeds Lebrun as Minister of Liberated Regions. 27 November 1919 – Léon Bérard succeeds Lafferre as Minister of Public Instruction and Fine Arts. Louis Dubois succeeds Clémentel as Minister of Commerce, Industry, Posts, and Telegraphs. 2 December 1919 – Paul Jourdain succeeds Colliard as Minister of Labour and Social Security Provisions. Clemenceau was a long-time friend and supporter of the impressionist painter Claude Monet, and was instrumental in persuading Monet to have a cataract operation in 1923. For over a decade Clemenceau encouraged Monet to complete his donation to the French state of the large Les Nymphéas (Water Lilies) paintings that are now on display in Paris' Musée de l'Orangerie. They are housed in specially constructed oval galleries which opened to the public in 1927. Having fought a dozen duels against political opponents, Clemenceau knew the importance of exercise and practiced fencing every morning even when he was an old man. He took an interest in Japanese art, especially Japanese ceramics. He collected around 3,000 small incense containers (kōgō 香合), which are now in museums. The Montreal Museum of Fine Arts held a special exhibition of his collection in 1978. James Douglas, Jr. bought an apartment in Paris for his friend Georges Clemenceau in 1926 to use as a retirement home. This building later became the Musée Clemenceau. Champs-Élysées – Clemenceau is a station on lines 1 and 13 of the Paris Métro in the 8th arrondissement. The stations platforms and access tunnels lie beneath Avenue des Champs-Élysées and Place Clemenceau. The Cuban Romeo y Julieta cigar brand once produced a size named the Clemenceau in his honour, and the Dominican-made variety still does. Similarly, there is a street named Clemenceau in a southeastern suburb of Montreal, Canada (Verdun). Clemenceau's famous line "War is too important to be left to the generals" is quoted by the character Gen. Jack Ripper in Stanley Kubrick's Dr. Strangelove. It is also quoted in the episode "Mindset" of Exosquad, but the writers use Charles Maurice de Talleyrand-Périgord as the source. One of Singapore's streets is named in honour of Georges Clemenceau. See Clémenceau Avenue. Mon. Georges Clemenceau was on an eastern tour in the 1920s, when he visited Singapore, and was invited to witness the foundation stone laying of the Cenotaph. At that visit, he had the honor to mark the foundation of Clemenceau Avenue. The Clemenceau Bridge (1920s) was a crossing over the Singapore River. A street in the center of Belgrade is named after him. This page is based on the Wikipedia article Georges Clemenceau; it is used under the Creative Commons Attribution-ShareAlike 3.0 Unported License (CC-BY-SA). You may redistribute it, verbatim or modified, providing that you comply with the terms of the CC-BY-SA.